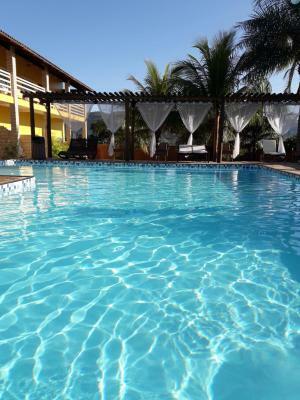 Lock in a great price for Pousada do Irlandês – rated 9.1 by recent guests! The service was excellent with only positive remarks. Breakfast was already included in our reservation and we also enjoyed a lot the full restaurant service, open till late at night, with delicious local food. 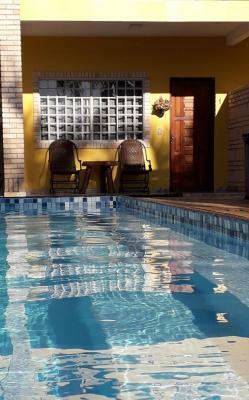 They also offer a bar service with cold beer and several drinks which can be served by the pool. Not having kids and teens around is great for relaxing without their shouts and noises. Did I mention the pool has solar and electric heaters? Once inside that pool one has second thoughts about visiting the many astonishing waterfalls nearby with ice cold water ;) One could also try the waterfalls during the day and come back to relax later on. The room was cozy, beautifully decorated and had a nice flat screen with sat dish and several channels in case you can't miss your favorite show. Location is okay, just a few minutes walking from the city center, parking is inside the property in a gated area, the heated pool is fantastic with bar service, and cozy furniture. Staff is one of the highest points, all friendly, helpful, and some speak English very well. Good breakfast, good lunch options, everything you need for an excellent price. Also, as a bonus, the owner (The Irish) plays his guitar and sings (very well) international pop rock sometimes at the bar. We will stay there again for sure! Wonderful staff, very friendly & professional. What a beautiful sunrise! I think that the receptivity was the people characteristic most important there. Patrick did a show amazing in the bar. It was the second time that i host there. I intend to come back. It was an absolutely wonderful stay! I highly recommend this Pousada for a romantic getaway. Very peaceful and quiet all weekend. It was so relaxing laying by the beautiful pool. The rooms are very comfortable. The staff is beyond accommodating and will do anything to make your stay great. The breakfast was great and very delicious. We will definitely return for a long weekend. 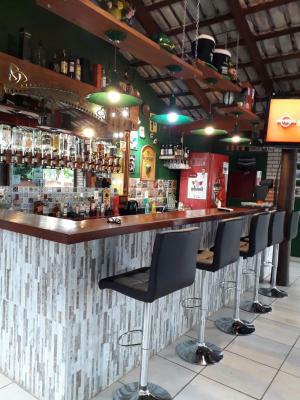 Todo o resto estava excelente, quartos confortáveis, funcionários prestativos, café da manhã muito bom, excelente bar com atendimento na piscina. Minha 2ª estadia e pretendo retornar. O atendimento é maravilhoso. Pessoas muito educadas e dispostas a ajudar com tudo! 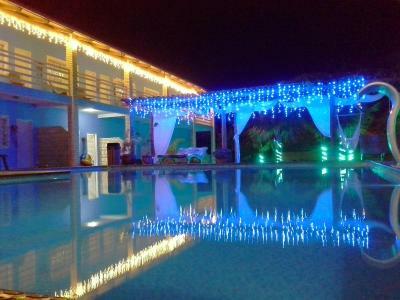 Fácil de achar, piscina boa, ambiente agradável, bar muito bom, o Irlandês muito simpático e carismático. O café da manhã é bom e tem itens variados. A localização é ótima. fica próximo da rua do lazer e tem bar e pizzaria bem perto. Dá pra ir andando. O dono e sua esposa são muito simpáticos e atenciosos. A equipe da pousada é eficiente e educada. sugiro apenas que coloquem aquele kit com sabonete, shampoo e condicionador no banheiro. One of our top picks in Pirenópolis.Pousada do Irlandês, located 2,650 feet from Pirenópolis’ Historic Center, offers a heated-pool and sun terrace. Free private parking and Wi-Fi are offered. The rooms feature simple, cheerful décor with flower motifs and forest views. They are fitted with an air-conditioner, TV with satellite channels and a mini-bar. The modern bathroom provides a hot shower. The guest house features an Irish-style bar that also offers snacks and a daily breakfast buffet. Pirenópolis bus station is 0.7 mi from the property. 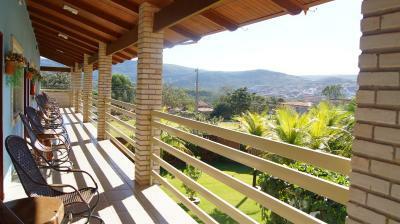 This property is also rated for the best value in Pirenópolis! Guests are getting more for their money when compared to other properties in this city. When would you like to stay at Pousada do Irlandês? This air-conditioned room located on the ground floor features a flat-screen TV, mini-bar and private bathroom with a hot shower. Free Wi-Fi is provided. This air-conditioned room is located on the ground floor. 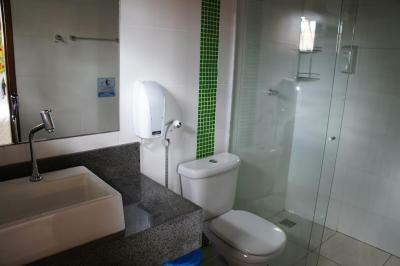 It features a mini-bar and private bathroom with a hot shower. Free Wi-Fi is provided. This double room is located on the top floor. It has a mini-bar and air conditioning. House Rules Pousada do Irlandês takes special requests – add in the next step! Pousada do Irlandês accepts these cards and reserves the right to temporarily hold an amount prior to arrival. One of the most picturesque neighborhoods in Pirenópolis! The only remark I'd make is about the internet that though functional was not fast enough for video calls or binge watching something but hey! Who wants to travel to Pirenópolis and watch Netflix anyways?? Roosters crowing in the middle of the night, neighbors staying up way too late past midnight.